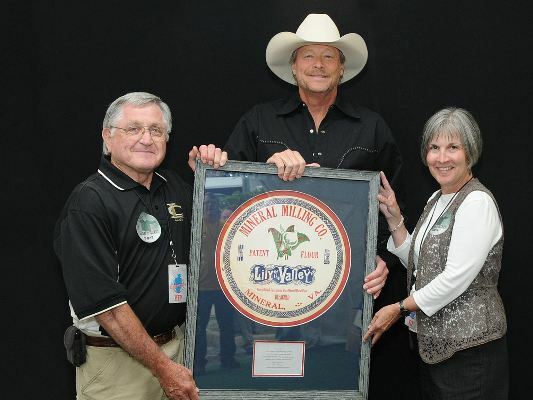 Sherman Shifflett, a 1960 Albemarle High School graduate and currently a Louisa County School Board Member, and Ava Pippon Director of the Louisa Educational Foundation, present a framed Mineral, Virginia antique to the Country Music Star Alan Jackson. Jackson was in the small community to put on a free benefit concert that raised over $152,000 for the Louisa Educationl Foundation. The Louisa County High School and one Grade School were destroyed by the earthquake last fall. Can you believe the little town of Mineral, VA (pop. 500+) hosted an Alan Jackson concert ? Mineral is in Louisa County Virginia? About six months ago there was a contest among small towns across the country to see who could get the most votes for a "free" Alan Jackson concert. After the 5.8 earthquake on August 23, 2011 voters across the country voted for Louisa County because they wanted to help the residents recover from the quake.The concert generated $152,000 for the benefit of Louisa County Public Schools. The Louisa Educational Foundation. Jackson with a framed barrel label (see photo) from Mineral Milling Company (flour was shipped in barrels many years ago). The barrel label is approximately 100 years old. He loved it. Mineral Town Council gave him a key to the town; Hhe also received several other local gifts including a Louisa County football jersey with his name on the back. Even folks who were not hard-core Alan Jackson fans left the concert with respect and appreciation for his generosity.